Indonesia has more than 15000 islands that need to be explored. In early 2017, Indonesia was capped as the Top 10 Most Beautiful Countries in the World following Scotland, Canada, New Zealand, Italy, and South Africa by travel guidebook and reference publisher grounded in United Kingdom, Rough Guides. In the same time, Dive Magazine recognized the exquisiteness of Indonesia’s marine destination and crowned Indonesia as the Best Diving Destination.We will find this exquisiteness in Indonesia marine national parks. There is no doubt that Indonesia’s gold under the sea can tease your eyes. Indonesia marine national parks such as Kepulauan Seribu, Kepulauan Taka Bonerate, Kepulauan Togean, and Teluk Cendrawasih. Indonesian big city, Jakarta, apparently leather the prettiness of Kepulauan Seribu Marine National Park. Enjoying sunset or sunrise in Kepulauan Seribu must be a romanticexperience. This park has 76 islands with 20 islands of them has already established as leisure destinations. There are also 26 beautiful places that can be dive. Here we can learn how to plant mangrove and conserve corals and turtles. You can install a tent and go camping too! Various range of budget is always welcomed in Kepulauan Seribu since there are a lot of cottages, guest houses, hotels, and trip packages. Nonetheless, if you want to tease your eyes a little further, perhaps you should go to Indonesia marine national parks in Sulawesi and Papua. Sulawesi Island is positioned in the east of Kalimantan. Sulawesi is the third larger in Indonesia territory. In the Southern Sulawesi, there lies Kepulauan Taka Bonerate Marine National Park. This park has been added in UNESCO World Network of Biosphere Reserves in 2015. Kepulauan Taka Bonerate has 15 islands to explore. There are 295 edible fish species such as kerapu (Epinephelus spp. ), cakalang (Katsuwonus spp. ), Napoleon fish (Cheilinus undulates), and baronang (Siganus sp.). Kepulauan Taka Bonerate has over 250 identified corals that ready to refresh your mind. This park can be reached by ferry from Bulukumba or by airplane from Makassar. On the other side of Sulawesi, to be exact Central Sulawesi, there is Kepulauan Togean Marine National Park. 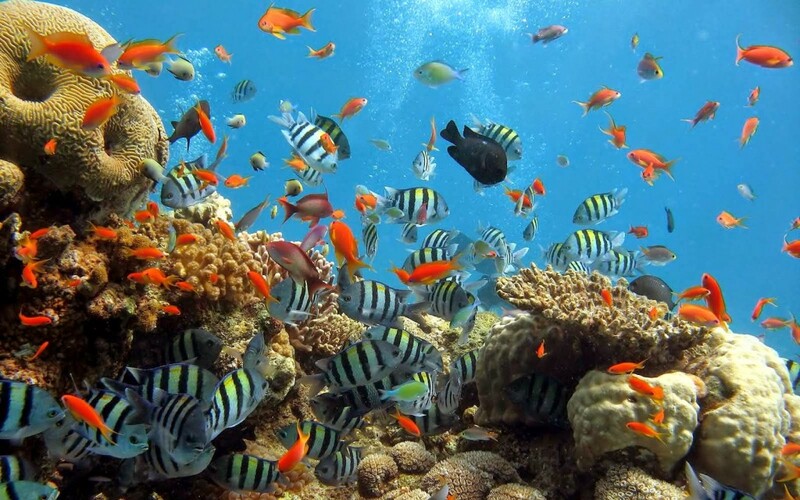 This park is known as the habitation of rare corals and marine biotas. You can go diving, snorkelling in one of this island, fishing, explore the untouched forest, hiking in Una-una island, or you can learn Bajo’s culture in Kabalutan. Coral reef and the beachin Kepulauan Tagean serve marine biotas like green turtle an ideal place to breed. Move to the east side of Indonesia, you can visit Teluk Cendrawasih in Cendrawasih Bay, Papua. Teluk Cendrawasih has been settled as marine national park since 2002. This park is the biggest marine national park in Indonesia and the habitation of Rhincodon typus. The coral ecosystem in Teluk Cendrawasih is one of the Coral Triangle parts. There are about 150 coral species scattered in 18 islands such as blue coral, black coral, Leptoseris sp., Mycedium elephantotus, and soft corals. Teluk Cendrawasih also the habitation of beyond 200 species of fish. From Jakarta, Surabaya, Denpasar, or Jayapura you can fly to Biak then fly again to Manokwari or Nabire. You can directly toward Manokwari or Nabire if you take a ferry from Jakarta, Surabaya, Denpasar, or Jayapura. From Manokwari to the marine national park, you should take a longboat to Rumberpon Island or a road trip using car then continue with motorboat to Ransiki City.